If you’ve been considering your competitors as roadblocks, or hindrances, you’ve been overlooking an important springboard to success. Business owners frequently consider their competition as the enemy. Many focus on “beating the other guy” because that’s how they measure their success just like in sports, where one side has to beat the other to win. However, by focusing on beating the competition, you will divert yourself from your real objectives: increasing profits, gaining more time and gaining more control. Bottom line, you will succeed at these goals only by improving yourself and your business, regardless of the competition. You can use your competition to further your own prosperity. Let s look at how this can be done. The first step in prospering because of competition is to identify and analyze the Real Competition. It s frequently not readily apparent. Sure, your business might have a new and unique products or services, but when the needs they actually fulfill are defined, you’ll discover that many other types of products and/or services fulfill similar (if not the same) ones. The second step is to evaluate your competition thoroughly to know more about them than they or your potential customers do. You gain considerable knowledge and power doing this, which you will be able to use during the next step. Your potential customers need to compare your business and your products and/or services to someone or something in order to see and feel that your products and/or services provide the best deal for them. Everything is relative, and comparison in buying is a very natural thing. You need to avoid and/or get relief from bad customer experiences. You quite often spend too much time, money and effort on extremely demanding, very price conscious, “unappeasable” customers, who almost always produce no profits and sometimes create losses. Even worse, they distract you from your best customers, who drift away in silence. You might as well let your competitors deal with these problem people and thus probably overlook the better ones who might seek you out. You show strength to customers when you don t fear competition. Many potential customers will try to threaten you and your business with “The Competition” as a negotiating tactic. Your confident understanding of your competitors and of your desirable customers will allow you to educate them to the real differences. This is how you can position your business favorably. You need to be pushed to continually improve. Monopolies create terrible consequences. Competition creates a desire to keep getting better. By not improving, a business is not standing still in reality it s declining toward its demise. Your competitors will frequently teach you new ways to reach your business goals. You will want to execute very profitable programs that follow similar, if not identical, programs previously instituted successfully by competitors. Does the term “re-engineering” sound familiar? Japanese automakers dissected American and European cars then took the best features and combined them into very desirable products that filled many needs the other automakers failed to provide. 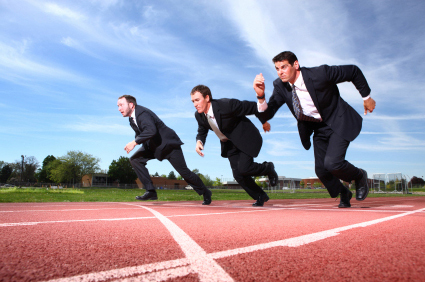 Your competitors will frequently supply some of your greatest business opportunities. They may choose to ignore your potential customers or interact offensively with them, or they may be incapable of providing the benefits that your customers want. Competitors will frequently open up markets that did not exist before, allowing you and your business to move in and prosper. Sound silly? Look how fast food restaurants feed off of each other by congregating in certain areas, making it very easy for customers to pick from a number of choices. Phase 3: Position your business to provide a desirable comparison. Establish your business so that it will be much more desirable to your target customers, when they compare you to your competitors. Use the knowledge gained in the above steps to create a comparative edge in as many ways as possible. Encourage your customers to compare, especially in the areas where you have the favorable edge. This allows them to make a confident decision to buy from your business, because you appear to be better for them than your competitors. There are examples all around you of business owners thriving because of their competition. One couple, for example, started a cleaning business in the face of an overabundance of competitors and greatly prospered, even with higher prices. They succeeded because they were the only business to quickly answer the phone with a live friendly person to immediately tend to customer requests. Their competition actually drove excellent customers to them. In another case, a development group created an extremely profitable new ski resort by concentrating on providing warm, courteous and ever-increasing benefits to their skiers. The existing ski areas considered themselves the “only game in town” and were more focused on treating their directors as semi-royalty, while they virtually ignored their paying customers. The developers of the new resort feasted on the monopoly the others thought they had. By using your competition and what you learned from them, you too can prosper because of your competition.